Explains Purpose of Plan to Buy Netherland Food Products for Shipment to Germany. Indicating that his gift of £1,000,000 to purchase produce for export to Germany was aimed to circumvent economic restrictions and communism. Sir Henri Deterding And The Nazis. The Dutch oil king, Sir Henri Deterding, is giving 10,000,000 Dutch florins to buy agricultural products in Holland for Germany. Sir Henri has long been regarded as one of the leading friends of the new Germany.–Reuters Wireless. Messages from the Continent Indicate; that neither Slgnor Mussolini nor Herr Hitler is hastening to reply to the communication sent by Great Britain and France about the enlistment of volunteers in Spain. Great Britain and Japan have formally informed the United States of their intention to invoke the escalator clause of the Treaty of London. In the year ended December 25 the foreign trade of Japan increased by about £27,000,000. The rise of a new agrarian party in the Netherlands, dominated by Sir Henri Deterding, may result from the oil magnate’s large-scale purchases of Dutch farm products for Germany, officials here said today. Another result may be preferential treatment for Sir Henri’s oil interests in a grateful Germany, these authorities indicated. The Scotsman – Tuesday, 29 December 1936, Page 9. 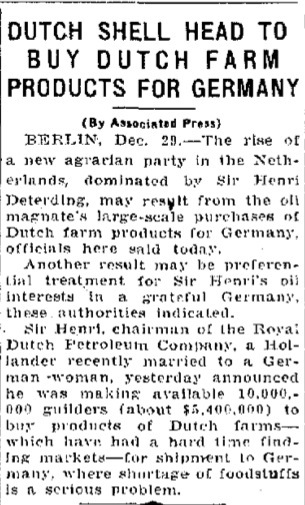 Berlin, December 28.–Confirmation of the report that Sir Henri Deterding, the Dutch oil magnate, is providing 10,000,000 guilders (approximately £1,100,000) to buy agricultural products in Holland for Germany is apparently given here to-night by the publication of the report in the official Nazi newspaper Angriff.